AUSTRALIA'S railway systems are mostly comprised of four different track gauges. 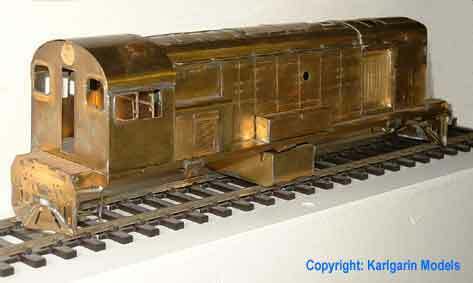 This range of 7mm scale (1:43.5) etched brass kits will include models of 2' 0", 3' 6" and Standard Gauge prototypes from Western Australia, Queensland, New South Wales, South Australia, Tasmania, the Northern Territory, the former Commonwealth Railways system and privately-owned operators. The prototypes chosen range in date from the 1880's to the present day. < The pictures show a test build of the first locomotive in the 'RooKits range. These 3' 6" gauge 730hp A1A-A1A's were constructed by English Electric in the late 1950's, for the Midland Railway Company of Western Australia. Known as the F class and numbered F40-46, all seven later passed into the ownership of Western Australian Government Railways (WAGR), latterly Westrail. 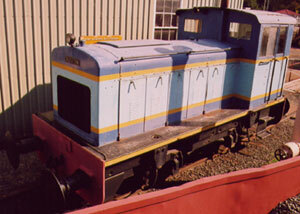 Withdrawal commenced in 1984, the last going in 1990; three were preserved. Class leader F40 was taken out of preservation in 2003 and reinstated to traffic for a further seven years, before once more being preserved, in full working order, in 2010. Bo-Bo variants ran in Tasmania (Y class) and South Australia (800 class), the SA engines being built to broad gauge. The lack of bogies in the photographs is due to the bolsters and mountings dropping out of the test etch. There are a few problems to be ironed out but hopefully what you see here will give you some idea as to what it's all about. Though this is a small prototype by Australian standards, the 7mm scale model is over twelve inches long. Whilst carrying out research for 'RooKits, it has become apparent that a number of locomotive types represented by kits in our Impetus range were used in Australia and New Zealand. It is our intention that suitably modified versions of these kits will be made available under the 'RooKits banner in due course. Work on this is well underway. Amongst these will be variants of the Ruston Hornsby 48DS and 88DS, Simplex, Manning Wardle K class and 16" Hunslet. < The ex-Emu Bay Railway 3' 6" gauge Ruston 88DS now preserved in working order at the Tasmanian Transport Museum. As far as we know, we are the first manufacturer to produce 7mm scale models of 3' 6" gauge prototypes, Australian or otherwise. Not surprisingly, there were no existing modelling standards, and no essential commercial items, such as wheels etc., readily available. So, we have made our own. In an effort to avoid the nonsense of severely compromised and incompatible standards prevalent in other scales/gauges, whilst retaining both simplicity and practicality, we have looked carefully, tested ideas and thought long and hard before choosing the standards to which our kits will be produced. In the end, the decision was simple. We have used the correct gauge, exactly. In 7mm scale, also commonly referred to as 0 scale, this means the rails are 24.5mm apart, hence the 0-24.5 terminology. This permits possible use in combination with either ordinary Finescale 32mm gauge, or ScaleSeven 33mm standards, should you wish to model the dual- or triple-gauge track which can be found in parts of Australia. Another benefit is that in 7mm scale, and with the correct rail gauge, the loco frames are far enough apart to allow the fitting of decent-sized motors. After all, some of these locomotives are VERY large, and not at all like those used on UK-prototype narrow gauge railways, or on the average logging, mining or sugarcane tramway. We have commissioned the production of finescale wheels specifically designed to suit. For those interested, back to back dimensions are 22mm, back to opposite flange 22.75mm. These run happily through check rail flangeways of 1.4mm and will also accommodate a differing crossing flangeway should you wish to model dual- or multi-gauge track to either Gauge 0 Guild or Aus7 standards. Track availability is a more difficult matter. With the prototype being of flatbottom rail (see below!) construction, it is fairly easily handmade, using readily available commercial components. To make trackbuilding easier, we will be producing suitable track gauges. We are also looking at producing some basic track components to speed the rather laborious task of building plain track, and will be making available some simple pointwork components and templates to aid construction. Whilst it is not possible to cater for every taste or preference, we feel that a reliable, simple-to-build system should be within everyone's reach and capabilities. Available now, in three sizes: our own exclusive and correctly profiled flatbottom rail for modelling Australian prototype track in 7mm/O scale. Full details can be found on the What's New page. If you are interested in modelling Australian railways in 7mm scale or 0 gauge, you may also be interested in joining the Aus7 Modellers Group and this discussion group: 7mmAusmodelling.